I have been a radio amateur since 1987. I used to be active a lot on VHF (2m) , mainly in the late 90’s. I went QRT in 2001. Since 2008 I am slowly getting QRV again. My main interest within amateur radio is weak signal, especially on the higher bands. 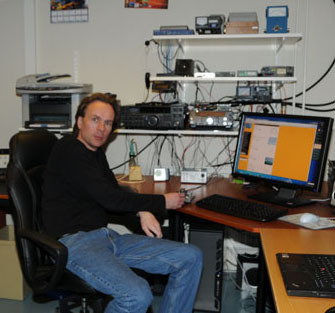 I have recieved lots of help from SM7GVF, Kjell and SM7THS, Sverker among others during the years of my ham activities. Thanks for your support. Besides amateur radio I enjoy being member of a dragracing team, as well as having some interest in Amateur Astronomy, Radio Controlled airplane models and Photography. My company BBJA-Handel AB is authorized reseller for LFA yagis by G0KSC design, AlfaSpid rotators M2 antennas, I0JXX antennas, Vibroplex keyers, ProSisTel rotators, SHF elektronik preamps, Wavenode meters and more.